The first Eisteddfod, according to BBC Wales, was held in 1176 at a castle in Cardigan. Lord Rhys awarded a chair to the best poet and musician of the cultural showcase. The modern equivalent of this tradition, the National Eisteddfod, traces its roots to Aberdare in 1861. Its resurrection came about at least in part as a response to the Blue Books of the late 1840s, which “launched a notorious attack on the character of the Welsh as a nation”. Soon, Wales would be known as the “Land of Song” in recognition of the ever­-competitive choirs performing at the Eisteddfod. Two major victories in London loom large in the choral tradition of Wales. Under the leadership of Griffith Rhys Jones (also known as Caradog), the 400­-old members of the South Wales Choral Union stunned English audiences and won the Crystal Palace Challenge Cup in 1872, returning for a repeat victory in 1873. When Caradog died in 1897, Aberdare commemorated him with a statue. By that time, the Welsh had also established their international reputation at the World’s Fair in Chicago (the same World’s Fair at which the Mormon Tabernacle Choir gained national recognition). 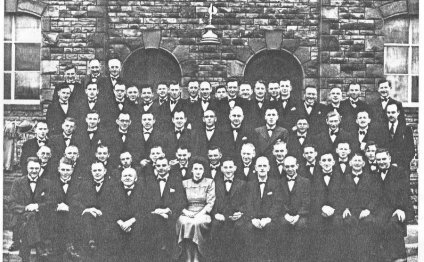 In a 2011 profile for The Guardian, Jude Rogers featured the Dunvant Male Choir (established in 1895) as the oldest amateur male voice choir in Wales. Rogers, a Welsh native, also boasts a personal connection to the group: her younger brother, Jonathan, is the choir’s musical director. “The sound made by the Dunvant Male Choir is a cornerstone of Welsh musical culture, ” Rogers wrote, “It’s the soundtrack to everything from the chapel to the rugby field to the rowdy pub singalong”. Throughout the years, the Dunvant Male Choir has maintained a core membership of 80 but this once ubiquitous feature of village living has faced a decline over the latter half of the twenty-­first century. Like many others before him, Dewi Morgan was introduced to the Choir through a male relative. He’s now considered a “life member” after over 50 years with the group. Morgan’s sons, however, show no interest in joining their father. “The modern malaise of the male voice choir is that there are too many other things to do, ” Morgan opined. Tim Rhys­-Evans, member of the Only Men Aloud choir that won BBC’s Last Choir Standing in 2008, theorized that gender expectations may play a role as well: “[I]t’s not cool to sing, or you must be effeminate if you’re interested in singing.” Considering that the original members of the Dunvant Male Choir were all miners, steelworkers, and quarrymen, it’s strange to see this old­-fashioned stigma resurface. For Bill Davies, another life member, the value of the Dunvant Male Choir remains unchanged in spite of its fluctuating popularity. “It’s the camaraderie you get from a choir that’s important, ” he told Rogers, “That’s something that younger lads need as much as us older ones. Singing makes you happy, after all.” Davies spoke from experience on this matter, but science is also in his favor. Of course, any young Welsh men considering a choral life should know that the Dunvant Male Choir has very strict requirements for entry. A statement to prospective members , “You do not have to be a trained singer or be able to read music, all you need is to enjoy singing and be willing to learn”.